The Borough of Belmar, New Jersey, rests at the heart of the state’s 127-mile Jersey Shore. It is tucked in between the Atlantic Ocean to the east and the Shark River to the north and west. Tourists from all over the country come to the boardwalks and beaches of Belmar, which literally means “beautiful sea” in Italian. Belmar is especially attractive to New York and Philadelphia vacationers, because of its close proximity to both metropolitan areas. While many are drawn to Belmar to sunbathe on the wide beaches or take a dip in the ocean, they come back for the all-around experience. Belmar boasts an active nightlife and plenty of family-friendly entertainment, whether it is an afternoon of shopping, checking out the local arts scene, taking in a sports event, or attending one of the many weekend festivals. Belmar is also a popular place if you’re looking for recreational ocean fishing or some of the best surfing waves on the Eastern Seaboard. Belmar’s beachfront is routinely ranked among the top in the state. The borough has playgrounds and bathrooms every few blocks along the boardwalk, which include cell phone charging stations and water bottle fill-up fountains. Beach chair and umbrella rentals are also available at the 8th Avenue Beach. There’s something for everyone, with beaches set aside for boogie boarding, sea kayaking, or surfing. Belmar even offers surfing lessons at the 3rd Avenue Beach for beginner surfers of any age. Belmar also has a rich history. It was once home to The Lenni Lenape nation, a Native American tribe that is thought to have migrated to the area from the Hudson Bay in what is now northern Canada. The Lenni Lenape people were known for their gentleness, spirituality, and respect for nature, according to the Belmar Historical Society. Indian Chief Wanamassoa sold land to European settler Galvin Drummond in 1687. In 1881, there were still only three or four farms in the area, but the population began to grow when New Jersey classified it as a borough in 1885. The borough was originally known as Ocean View until the name was changed to Belmar just four years later. 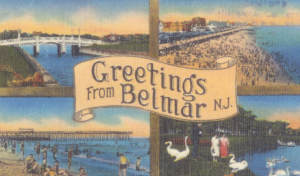 By 1900, census data showed a population of 902 people in Belmar, and the borough now has an estimated population of 5,684. 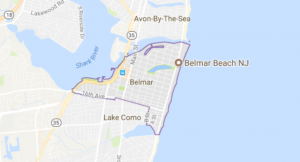 Belmar is in Monmouth County, which is part of the New York City metropolitan area. Locally, a mayor and four other council members represent residents of Belmar. It is part of the 4th Congressional District, a seat currently held by Republican Chris Smith. Belmar is also in the 30th legislative district of New Jersey. The borough of Spring Lake is directly south of Belmar along the Jersey coast, and Avon-by-the-Sea is on the other side of the Shark River to the north. Like many communities along the Jersey Shore, Belmar was not spared from Hurricane Sandy in 2013. Sandy cost New Jersey businesses an estimated $30 billion and almost 350,000 homes were damaged across the state. Belmar had just finished construction on a new boardwalk six months before the hurricane hit. Since the storm, Belmar’s boardwalk has been rebuilt along its 1.2 miles of beaches, and is once again a great place to walk, jog, or enjoy the ocean views. Located in Monmouth County, the neighborhood of Belmar NJ is a great vacation spot. Do you want out of the hustle and bustle for awhile? With only two zip code, this borough in eastern New Jersey literally translates to ‘Beautiful Sea,’ and that is what you should expect upon your visit. Belmar is Italian, so it makes you think there might be some great Italian food waiting for you. There are also many fun things to do in the area, and here are five of the top attractions in Belmar NJ. The Belmar Beach and Boardwalk is certainly one of the top places to visit. You can pick a spot on Ocean Avenue along a stretch of 20 city blocks. You have the beautiful beach right there to enjoy, and there are plenty of restaurants in the area, food trucks, too. The Boardwalk is a nice place to take a stroll, and maybe you want to bring that boogie board and catch some waves, too. It is a great stop for families, and the area is said to have a nightlife scene as well. Beach Haus Brewery is on Main Street, and it is said to feature a very casual atmosphere. That’s what you would expect from a beach brewery, and reviewers talk highly of the tasting room and craft beers. There is also a nice gift shop to visit. You have to pick up a good souvenir or two, don’t you? The Beach Haus Brewery should be a fun stop and tour for you. Are you looking for some sweets? Sweet treats are a vacation must, and there is no better place to get them in Belmar than an establishment with the name ‘Sweet!‘ The owners even put an exclamation point on there for everyone to know that this is the spot. Whether you want fudge, cake, ice cream or brownies, they have it. They serve up shakes, too. Fishing is also very popular in Belmar, both for the locals and the Vacationers. The Ocean Explorer is one of those fishing trips that you can book. You can find it on State Route 35 at the Belmar Marina. One fish you will be looking out for is the sea bass. There are other top fishing adventures that you can book in the area as well, but The Ocean Explorer is one of the favorites. Go Play! Retro Arcade is something a little different. It sounds like a fun vacation stop, wouldn’t you say? You have three options when it comes to game play. You can either pay for the day, an hour or half an hour. It is up to you and how much energy those kids of yours need to expend. Are you going to make Belmar NJ your vacation spot for this year. If you aren’t too far away, it would also make for a nice weekend excursion with the family. This is a chance for you to get away from the hustle and bustle as mentioned and enjoy a little small town beach life, Belmar style.